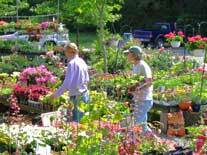 Join us on Saturday, April 27, from 11 a.m. to 5 p.m. for our annual potting party. Bring your own container, and we'll supply free advice, soil, and fertilizer. We have lots of beautiful plants to get you started. Bring your friends and plant your pots together. We hope you can join us. If you don't want to plant containers, you can start your season by planting early pansies and perennials; plant perennials once and enjoy them season after season! Love the deer but would rather not feed them with your plantings? We can help with that. Come see us! Would you like to receive mail from Heather Hill Gardens? Click here to send us your name and snail mail address, e-mail address, or both, and we'll add you to our list. 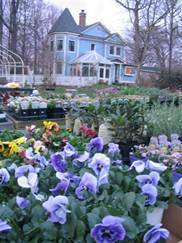 Contact us at gardener@heatherhillgardens.com with questions or special requests. Serving Alexandria, Annandale, Arlington, Burke, Burke Centre, Centreville, Chantilly, Clifton, Dale City, Fairfax, Fairfax Station, Falls Church, Kingstowne, Lake Ridge, Laurel Hill, Lorton, McLean, Manassas, Oakton, Occoquan, Springfield, Reston, Vienna, Washington, DC & Woodbridge.